A sparkling, white smile is often seen as a mark of beauty, health and even just general personal hygiene! Years of drinking coffee, tea or wine often give adults mild staining on their teeth. If they have been smoking for many years or avoiding dental care, the yellowing or darkening of teeth can be more severe. Even without major staining, many people just want to achieve that dazzling bright smile, and turn to various whitening methods to get their teeth to be whiter than their natural color. The tooth whitening industry is huge. There are a ton of products on the market, advertising with beautiful pearly whites and promising consumers that they can have the same. There are so many different tooth whitening options, it can be hard to know what is worth the price and what is safe for your teeth! Consumers can whiten their teeth at home or have their teeth whitened professionally in a commercial teeth whitening center or their dentist’s office. Home whitening kits include products like whitening pens, trays, strips, gels and toothpastes. These whitening products are generally pretty gentle and gradually whiten your teeth over time using mild to strong bleaching agents. A typical ingredient in these kinds of products is peroxide. However, ingredients and their concentrations can vary, so be sure to do a bit of research on the product before purchasing it. Home whitening kits with stronger bleaching agents will have faster, more dramatic effects. Professional whitening services tend to offer more dramatic results than at-home products. Professional treatments include peroxide-based bleaching agents, LED or UV lights and lasers. The peroxide-based treatments used in a dentist’s office are a much higher concentration than the products you can buy over the counter. Dentists oversee the procedure to make sure it is done safely. Because the solution is so much stronger, teeth are whitened rapidly and more drastically. In fact, most professional whitening treatments take less than an hour to complete! Some professional teeth whitening treatments also incorporate the use of lasers or LED/UV lights. 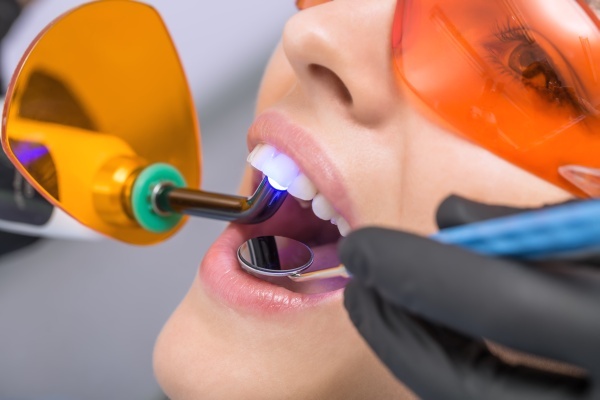 The lights add some heat to the solution on your teeth, and while many service providers claim that using a heating source may speed up the whitening process, some researchers refute these claims. So, is professional teeth whitening dangerous? As long as you are starting with healthy teeth and healthy gums, professional teeth whitening will not be dangerous. Teeth cleaning and a check of overall oral health should be done before any professional-strength treatments. If you do have gum disease, your dentist may be able to carefully paint a professional strength solution on your teeth to give you the results you are looking for, without affecting your gums. Although having your teeth whitened is not dangerous, rapid teeth whitening can cause tooth sensitivity, which can be uncomfortable for some people. The sensitivity usually goes away in less than 24 hours, so for many people, dealing with the discomfort is worth the quick results they get from getting their teeth whitened professionally. For others, the sensitivity is too much, and they prefer to gradually whiten their teeth at home. Be sure to speak with a dentist before having any professional treatment done. Are you considering professional teeth whitening in the Chandler area? Get more professional teeth whitening information at https://impressionsdental.com. « How Does Dental Plaque Affect Teeth?